Shannon and Janine are among the millions of people who enjoy doing genealogy research. In fact, as a genealogy blogger, Janine devotes a significant amount of time to it. 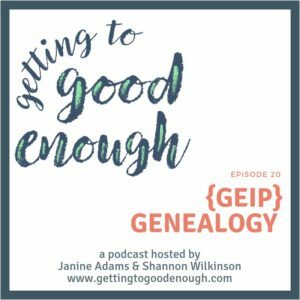 In this, our second Good Enough In Practice episode, we discuss Shannon’s challenges with her genealogy research (which involve an enviable literal treasure trove of original documents given to her by her mother) and discuss some strategies to help her get past the perfectionism that’s stopping her from proceeding with her research. Bonus! We get an update on Shannon’s morning routine at the end of the episode. 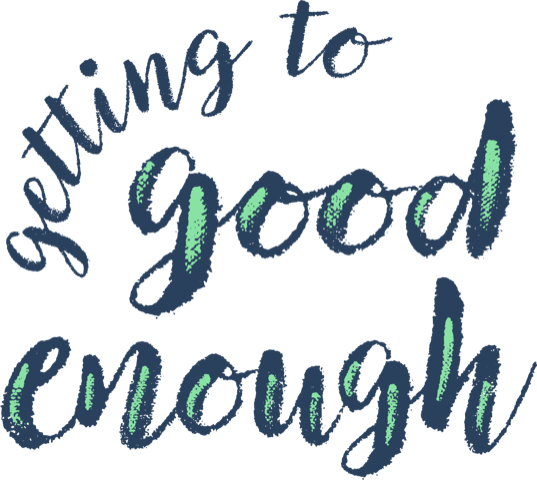 She shares how her good enough attitude and the minimum standards she has set have helped her establish and stick with a great morning routine. 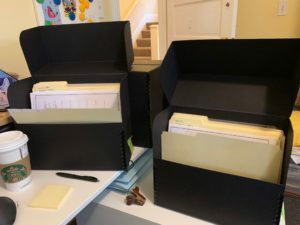 Comment from Shannon: Right after we recorded this episode, I purchased archival document boxes and folders and started sorting my documents into them. It was a perfect rainy day Sunday activity and I no longer feel overwhelmed! I enjoyed your episode about not letting perfectionism get in the way of your Genealogy. That is definitely the problem I am having. I keep reading about how to do it, and not getting starting because of this. Here is one thing that really gets me hung up. I am striving to create a paperless office, and I am all about getting rid of papers in my home. I am competent with technology and have responsible systems for backups, so I do not fear losing digital records. I would like to make archival scans of my personal family history documents, like newspaper clippings, personal letters, and photographs. Then, eek!, I’d like to toss them. I do not want to keep them in archival quality files. In all that I have read, no one seems to think this is a reasonable thing to do. I do not have special feelings when I hold an actual paper record, and the burden of storing them properly gets me stuck. My family and descendants are a small bunch, and I often doubt whether anyone will ever even care about my research, so preserving the physical copies for some theoretical future possibility seems like a reach. I guess I am looking for permission to toss these items so I can move forward. I’d like to hear if others have done so without much regret. Thanks. Hi, Jeri. Thanks for your comment. This is Janine. You absolutely have my permission to let go of that stuff after you’ve scanned it. If there’s any family member you can offer them to, i’d suggest you try. But if no one else wants them, you don’t have to keep them.